Existing in worlds of both religion and science I come across people who are radically biased against one or the other, and there will be certainly people who see this book and think it is too great a stretch of Biblical theology into realms of science, or politics. And there will be those who see the science, the ecology as clearly important, but the theology not mattering, even perhaps being detrimental. I’ve met ecologists who want nothing to do with Christianity because they feel that the religion has been used to great environmental harm, and see no value in it. I’ve met Christians who think scientists make up data that overemphasizes the fragility of the environment, or view any environmentalism as equating idolatry. Thankfully this book exists as a focused middle of the road alternative to those who do not accept either of the extremes and feel there is a place for the two worlds to dialogue. And here, not surprisingly the emphasis is for arguing for Christian involvement in ecological concerns, and providing the resources to act, the intended audience is Christian, but it is geared towards either end of the cultural spectrum from progressive to more conservative. 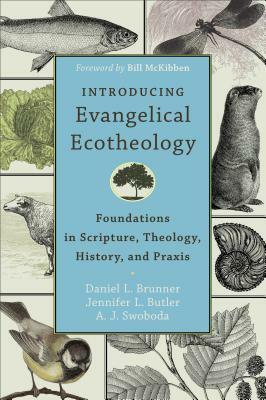 I haven’t come across anything like Introducing Evangelical Ecotheology before and was curious to see how it was approached while not outright alienating people who may be close to the borders of the Christian spectrum extremes. Written by a trio of people from a range of Christian backgrounds, the text largely succeeds. The premise at the book’s heart is the concept that Jesus’ message was for all people and that he held specific regard for those on the margins of society. As we now see that people on the margins are most vulnerable to ecological conditions – and that the health of the environment is of growing concern – then care for the environment should be a concern for discipleship. As an integrated text from multiple voices, there are certain issues where precise agreement wasn’t reached. The authors chose to put key discussion of these issues into separate boxes called ‘Tension Points’ and within the purpose of the book it works very well, as the book’s best audience would likely be a book club type group or class within a church, who may find these good discussion points, providing a format to keep the talk civil between disagreeing views. A large number of references are also provided for a serious student’s interest in the topic to go deeper, or back to the sources. Readable without dryness this would be a wonderful book for either an individual or group to read, and the latter portion of it provides challenges to take the ecotheological themes to heart and put them into practice in meaningful ways both large and small. While the intended audience is Christian the book as a whole or in key parts would also be effective for showing to non-Christians allies in addressing these ecological concerns, simply as evidence that not all Christians are uninterested or unconcerned over the health of the environment. Many see it the problems and see it as a failure on many levels (including within the faith) and feel called on levels both religious or humanist to address them. Disclaimer: I received a free advanced reading copy of this from Baker Academic via NetGalley in exchange for an honest review.